In support of the Expanse trilogy, James S.A. Corey, a pen-name for authors Daniel Abraham and Ty Franck, has been publishing a series of novellas set in the same universe (or, perhaps a more apt term would be solar system… get it?) as their popular inter-solar series, which began with 2011’s Hugo-nominated Leviathan Wakes (REVIEW), and was joined by 2012’s Caliban’s War, to be concluded in 2013 with Abaddon’s Gate, ‘Gods of Risk’ is the second of these novellas. 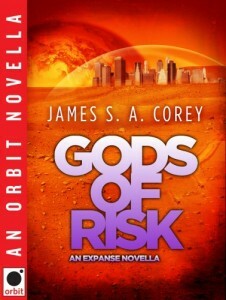 Though ‘Gods of Risk’ is set during the same time period as the Expanse trilogy, and featuring cameos by both characters and conflicts from the mainline novels, knowledge of the series in unnecessary. ‘Gods of Risk’ is an intimate story about a young martian (meaning, ‘born on mars,’ not ‘alien from mars’) man, Daniel Draper, a brilliant, but somewhat troubled student and drug manufacturer. The obvious comparison here is to television’s Breaking Bad, though Daniel’s insertion into the drug dealing community isn’t the result of desperation or need, but through social pressures and because, well, as a top-level chemistry student, he’s good at it and has access to the materials, making him an easy and obvious target for Hutch, a volatile drug dealer and tentative friend. You’re a tough guy, but I’m a nightmare wrapped in the apocalypse. Though Daniel’s place in the world of martian drug dealing is at the core of the story’s plot, the real meat is his own self conflict as he struggles to juggle the social, educational and societal pressures of being a teenage drug dealer during troubled times in a Martian colony littered with guerrilla warfare and terrorism as war threatens to break out between Mars and Earth. Of note is Daniel’s relationship with his aunt Bobbie, recognizable to readers of Caliban’s War, who is both an enigma and a mentor to Daniel, and Leelee, another youth caught up in the drug game who is as aggressive and political in her leanings as Daniel is passive and apathetic towards anything but school. You see, Daniel’s the type of drug dealer who makes the stuff, helps his friend distribute the stuff, but has little-to-no interest in experiencing 3,4-methylenedioxy-N-methylamphetamine (because apparently chemistry students are too good for the name ‘ecstasy’) for himself. It’s a means to an end, that’s it, and that detail alone sets the stage for the growth of Daniel’s character through the end of the novella. Corey tells a nicely rounded story in ‘Gods of Risk,’ using the novella length to draw both strong characters, a well-developed conflict and just enough attention paid to the setting that the story feels grounded. It might lack some of the action, set pieces and stakes that it’s bigger brothers are known for, but the novella makes up for it with thoughtful storytelling, an interesting plot and believable, if not always likeable, characters. It’s easy to call ‘Gods of Risk,’ Degrassi Junior High-meets-Breaking Bad-meets-Total Recall, and maybe that is all it’s meant to be, but there’s a nice character drama here and the novella stands as well as a stand alone story as it does a larger piece of the overall Expanse series. Worth of a shot if you’re a fan of Corey’s novels, or curious about his universe. Just read this the other day and enjoyed it, and The Butcher of Anderson Station too. “Drive”, in the Edge of Infinity collection, was also great. Hope they do more of these shorter works.